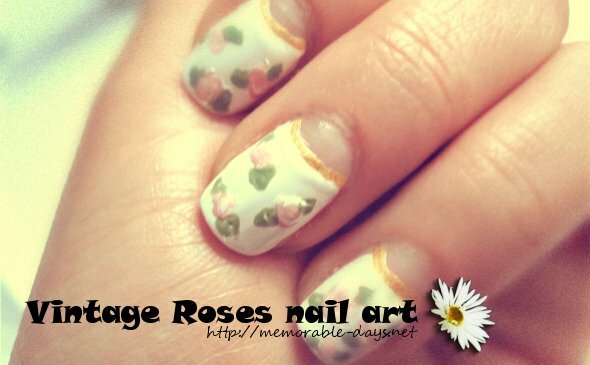 Vintage Roses Nail Art (Short Nails) | Memorable Days : Beauty Blog - Korean Beauty, European, American Product Reviews. A short blogpost today. In this blogpost I'm going to show you my NOTD ^^ and I call it the Vintage Roses Nail Art. This is not a tutorial since it's quite similar to the Summer roses nail art that I did before. I just used the same method like the previous time to create the roses. However, this time I used a light pink and white nail polish. The color combination makes it a bit vintage style :), don't you think? Many people were leaving comments on my nail art blogposts saying: "I need to wait till my nails are longer to create the design.." However, I don't think it's always needed. Many nail designs can be created on short nails as well ^^, just like this one, just try it out ^___^. Leave a comment below to let me know what you think about this design ♥.